Parents, are you looking for something cute and cuddly to dress your infant in this Halloween? Don’t pick a costume you’ll just have to put out to pasture later. 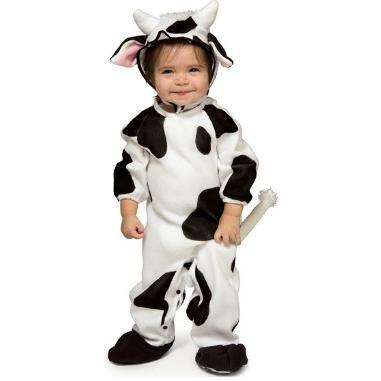 Your child will be absolutely adoreable in our Crazy Cow Infant costume! He’ll look cute as a button in this costume with its black and white spotted romper with its tail, booties, and ears and horns cow headpiece. You’ll get compliments from all of your family, friends, and neighbors when you take your infant out to trick or treat! You’ll also enjoy a ton of photo opportunities! Since it’s comfortable enough to wear anywhere, any time, you’ll get use out of your Crazy Cow Infant costume even after Halloween! Animals make good, safe, clean costumes that you can feel good about dressing your child in. Don’t wait for this item to go out of stock! Get your Crazy Cow Romper Infant costume today!